People are often surprised when they learn that there are huge differences between the bullion value of coins and their collectible, or numismatic, value. This is one of the big lessons that collectors and investors must learn as they grow further in the hobby of coin collecting or the pursuit of investing in bullion metals such as silver and gold. It often comes as a shock when wannabe investors, silver stackers, or gold bugs find out that not every gold or silver coin on the market necessarily makes a great buy as a bullion investment. Likewise, many newbies are stunned to learn that coins aren’t necessarily worth a lot just because they’re old or were made in small numbers. Bullion value – The value a coin is worth solely for its intrinsic metal content, which could be gold, silver, palladium, platinum, copper, or any other metal. Numismatic value – A premium paid for a coin due to its historical significance, rarity, condition, or other factors not directly related to bullion content. Of course, that’s a totally fair question to ask. But, usually the answers to such questions are found in checking out matters such as mintage figures, historical facts about said coins, and other things that may not immediately meet the eye. As most seasoned coin collectors know, the 1909-S VDB cent is one of the most storied collector coins around; it was struck for just a few short weeks until public outcry over designer Victor David Brenner’s VDB prominent initials on the reverse of the coin compelled the Mint to temporarily remove the three letters. As a result of the controversy, only 484,000 of the 1909-S VDB pennies were ever made. Perhaps 50,000 of these coins survive today. What’s more? Literally millions of coin collectors want a 1909-S VDB penny, so the demand for the coin is far greater than its supply, thus the higher value for the 1909-S VDB cent. So does that mean all coins with mintages of, say half a million, are worth between $500 and $1,000 in circulated grades? Unfortunately, it’s not that simple of an equation. Take, for example, the 1867 Indian Princess Head Type III gold dollar. This is a coin with an original mintage of 5,200 pieces and, in addition, it contains gold – 0.04837, ounces to be exact. Yet, this coin, some four decades older than the 1909-S VDB cent, is presently worth just $400 in the moderately circulated grade of Very Fine-20. So, here we have a coin that has an original mintage of just 5,200, an estimated current survival population of 150 pieces (yes, only 150 pieces), and yet it retails for only about half the amount that a 1909-S VDB Lincoln cent does in a similar grade. What’s up with that? Remember how it was mentioned earlier that millions of people collect Lincoln cents? Comparatively, only a fraction of that number of people actively collects 19th-century gold coins, and perhaps only a handful of individuals are assembling complete date-and-mintmark sets of Type III gold dollar coins. Therefore, the number of people specifically seeking an 1867 Indian Princess Large Head gold dollar is so small that there isn’t much pressure on the prices of those coins. Yes, the 1867 gold dollar is worth much more than its intrinsic gold value (which, as of this writing in 2015, is equivalent to about $53). The $300 to $400 numismatic premium on that coin is substantial and does reflect the coin’s overall scarceness, but the numismatic premium would surely be much, much higher if Indian Princess gold dollar coins were widely collected by date and mintmark. For those looking for some consistent type of scale or ratio that formulaically illustrates the relationship between melt value and numismatic value across all coins, such a metric does not exist. It would be convenient for the consumer to know if, say, all gold dollars with mintages between 5,000 and 10,000 were worth exactly eight times their melt value in a grade of Very Fine-20. But that simply isn’t how the coin market works – pricing is a much more complex matter than that. Coin values aren’t regulated in the way that many commodities are. Often times, the actual amount that a coin sells for is merely dictated by how much the collector is willing to pay. If for some reason interest in 1867 Indian Princess gold dollar coins was to completely cease to exist altogether, that $400 coin would essentially be worth only what its metal value is – no more, no less. The same is true for the 1909-S VDB cent; in fact, the value of the 1909-S VDB penny did fall a bit after interest in that coin tapered off following the hype of the 100th anniversary of the Lincoln cent in 2009. By the way, coin values, as listed here and in other price guides, aren’t supposed to represent a “standard” worth. Rather, coin price guides tend to reflect only what the typical transaction prices for said coins. In other words, some people may be paying more than $400 right now to buy a Very Fine-20 1867 Indian Princess gold dollar coin, and others are paying less. The only guaranteed value of any coin is its face value. Beyond that, bullion markets and the whims of coin collectors will vastly affect how much any coin is “really” worth. What Coins Should Bullion Investors Buy? Bullion coins have a substantially different market than collector coins do. While numismatic coins are bought and sold by people who are collecting coins based largely on date, design, historic factors, or other reasons, bullion investors mainly buy coins only with regard to the metal within the coinage. Bullion buyers want to stack gold and silver coins as high as they can for as little money as possible. While some uninformed bullion investors may think that any gold or silver coin makes a good buy to meet that end, the reality is that most classic silver and gold coins make inefficient investments for these individuals for the reasons explained above. Some gold coin buyers, perhaps those who romanticize the 19th-century days of the American Wild West, wish to stack up classic pre-1933 gold coins such as Liberty Head $2.50 gold quarter eagles, $5 gold half eagles, $10 gold eagles, and $20 gold double eagles. While this could be an interesting goal, the fact is these people will be paying hundreds more per ounce of gold to obtain these old gold coins than they would if they simply bought American Gold Eagle coins, which were first struck in 1986. Unlike the pre-1933 gold coins that lure collectors and non-numismatists alike, the gold and silver bullion coins that the United States Mint strikes today are generally priced on a melt value contingent. In other words, the premiums on these coins are much, much smaller than the numismatic values collectors place on coins such as Saint-Gaudens $20 coins – or even that 1867 Indian Princess gold dollar mentioned earlier. The prices of American Gold Eagles and American Silver Eagles fluctuate daily, and sometimes even hourly, based on the prevailing bullion market. These coins, therefore, are much more closely tied to the metals market than pre-1933 gold coins or classic American silver coins such Liberty Seated and Barber coins. Perhaps one of the biggest downsides to buying bullion coins over numismatic coins is that the value of bullion-grade coinage doesn’t hold as well when metals prices fall as classic numismatic coinage, which has an active collector market to help keep the base price more stable. This is certainly a consideration that anybody buying gold and silver coins will need to bear in mind as they decide what types of coins they wish to buy for their collections or bullion portfolios. Yes, classic gold coins and older, common silver pieces, often referred to by metals investors as “junk silver,” are great buys for those who wish to store physical gold and silver. After all, not only do these coins offer a tremendous and convenient method for buying precious metal, but also they have appeal among collectors and historians, too. Why, even among junk silver coins, some pieces are better buys than others. All 20th-century 90 percent silver dimes were made with the same amount of silver, but silver Roosevelt dimes often cost a tad less than the more collectible Mercury dimes. Older junk silver Barber dimes, on the other hand, are often so badly worn that they contain significantly less precious metal than their more recent, less-worn Mercury dime and Roosevelt dime counterparts. The question, really, is how much is one willing to pay to buy that silver and gold? Those who are looking for the lowest premiums over spot clearly should choose bullion coins, of which there are many types from mints around the world, in addition to the American Eagle coins from the United States Mint. Investors who are less concerned with immediate profit and want to buy coins with wide overall buyer appeal may lean toward the common pre-1933 gold coins and pre-1965 90 percent silver U.S. coins. Again, though, premium over spot will be the most important factor in deciding which classic coins make the best buys in those cases. Now that there has been some clarification as to what melt values are, why numismatic premiums exist, and how the two factors sometimes do (and don’t) affect the other, it becomes easier to understand how complex this matter is within the coin industry. Coin prices, being merely the guide that they are, are often negotiated up or down (based on who is selling and who is buying), and bullion values, especially during turbulent economic times, may change substantially within hours, even minutes, necessitating cash or wire transactions rather than credit; this is just one reason that layaway is virtually never offered as a purchase option for coins containing substantial gold or silver content. Some coin collectors will purchase copies of The Greysheet for themselves to use as a personal reference when buying and selling coins; this is a prudent idea for those who are active buyers and sellers. Bullion investors, meanwhile, will pay more attention to the moment-by-moment gold and silver tickers on sites such as this one. However, coin collectors and bullion investors are wise to keep tabs on both the numismatic premiums and metals prices, because either valuing factor can come into play when buying and selling gold and silver coins. 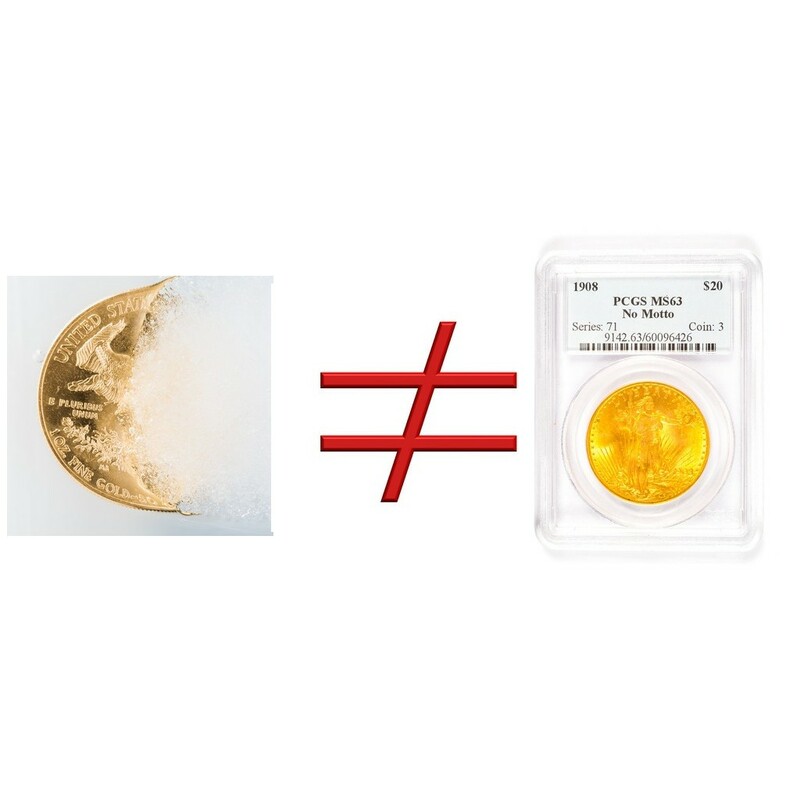 At the end of the day, it’s important to remember that melt values and numismatic premiums will affect the prices of virtually all gold, silver, platinum, or palladium coins – even bona fide bullion coins, which cost slightly more than equivalent-sized ingots and bars due to a very small numismatic premium. Understanding how much these factors play into the price of a specific coin will require individual research as to the particulars of the given coin. Indeed, there are no cut-and-dry metrics or specific formulas that will automatically provide reference on how much numismatic premium a said coin will have over its melt value. However, an intimate knowledge of coin prices, which one can gain from perusing the Coin Values site and referring to other coin publications, will go a long way toward helping buyers understand the intricacies of the coin industry and, of course, how much their coins are worth.